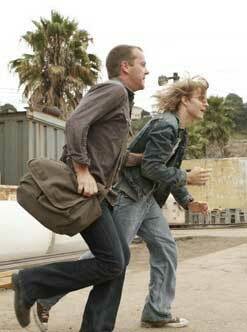 The Bauer Bag - Fox 24 - Jack Bauer's messenger bag, Manpurse, Bauerbag, Bauer Bag or whatever you want to call it! Jack can run really fast to escape danger. if you buy this bag, you can run and not worry about losing all your stuff. You can save people too. Jack Bauer carries this bag everywhere. It's the equivalent of Batman's utility belt. Jack Bauer has every gadget he might need in here. While you can't get all the gadgets (unless you get a job as a field operative at CTU), you can have the same bag that Jack uses to defeat any enemy that might come your way. It's not a messenger bag, it's not a man purse, it's the BAUER BAG! You can be cool too! 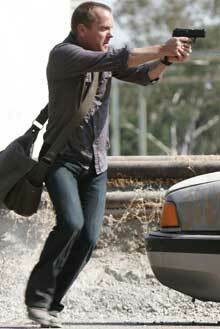 Jack shoots people while carrying his bag. You can't shoot anyone, but if you buy this bag, you can be cool like Jack Bauer.